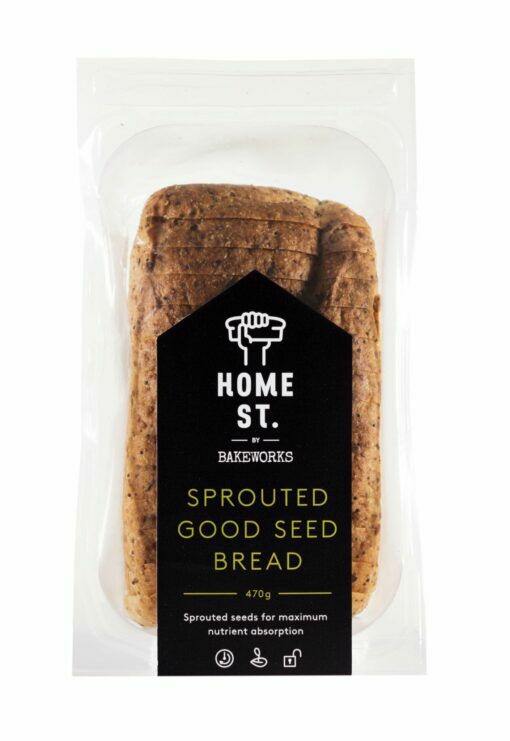 Home St. has been carefully created to invigorate the bread market. Every ingredient has been hand-picked based on its nutritional properties to create something special. Home St. Sprouted Good Seed Bread uses sprouted and activated seeds meaning the nutrient store has been unlocked, making them more bioavailable. Thanks little seeds for coming to life for us! Home St. – It’s all about sprouting and activating! Our ancestors figured out that by soaking and sprouting seeds, nuts and grains they became more digestible and provided higher nutrient values. How is this so? Well, when we soak and sprout, the seed is activated (think flicking on a light switch), this means the sleeping enzymes inside start to awaken! Basically the seed is bursting into life (to grow into a wee plant), this is the optimum time to consume, as the seed unlocks all its nutrients and minerals in order to grow. Just 2 slices of Home St. bread gives you all this goodness! 20% of your daily fibre needs. We all need fibre and we all know why! 16% of your daily Vitamin B6 needs. Helps maintain healthy brain function and helps with digesting proteins into our system. 9% of your daily Vitamin B1 needs. Helps maintain cardiovascular health. Important for energy production – converts sugars into energy.. yeah! 8% of your daily iron needs. Vital for muscle health. Iron also helps boost and carry oxygen levels in the blood, important for brain health and energy levels… go Iron! 11% of your daily Magnesium needs. Key role in regulating blood pressure, for every 100mg of magnesium taken (6 slices of Home St. bread!) on a daily basis, equals a 15% decrease in the risk of developing type 2 diabetes!.. Amazing. 10% of your daily Manganese needs. Huh?, what’s that? Well manganese is very important for aiding calcium absorption as well as being very effective in helping boost the mineral levels in your bones … who knew! 6% of your daily potassium needs. Essential macro-nutrient which helps promote conductivity in the brain. That’s why bananas are called brain food, due to their high potassium levels. 5.5% of your daily sodium needs. Great lower level of sodium at 200mg/100g! Just to note, some gluten free breads are as high as 420mg/100g..
* Nutrient information just a basic summary of some benefits . We recommend you look into these vitamins and minerals yourself to discover even more goodness. * Percentage Daily Intakes are based on an average adult diet of 8700kJ. Your daily intakes may be higher or lower dependent on your energy needs. ** Recommended dietary intake.